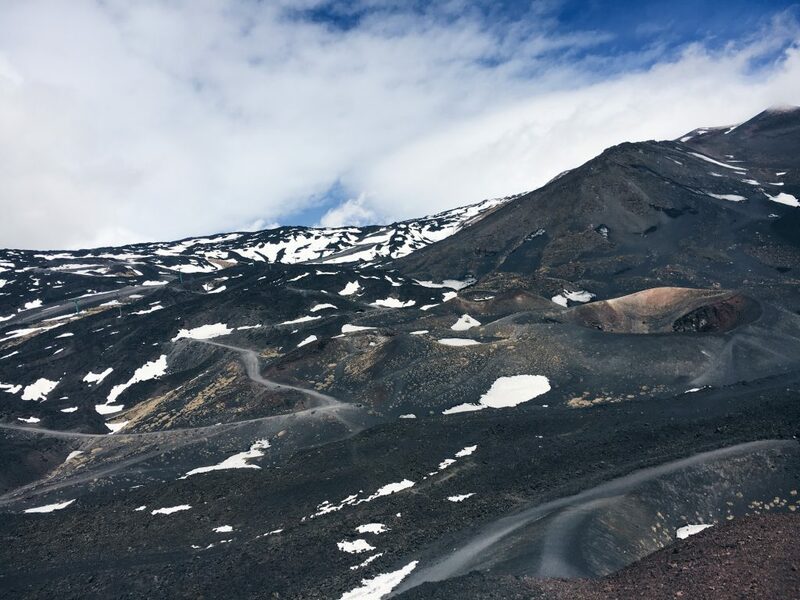 On our last day in Sicily, we visited Mount Etna, an active volcano on the east coast of Sicily in Catania. As the mountain grew steeper there was fewer vegetation and more ashes and sand. Although we did not summit the mountain, it was very cold and windy at our stop point. The views of Catania below were breathtaking, as well as those looking up the mountain (photo above). After Etna, we visited the rocks of the cyclops in Aci Trezza. According to the legend, these rocks, which sit in the water on the coast of Catania, were thrown by the cyclops to express his rage against Odysseus, from Homer’s Odyssey. 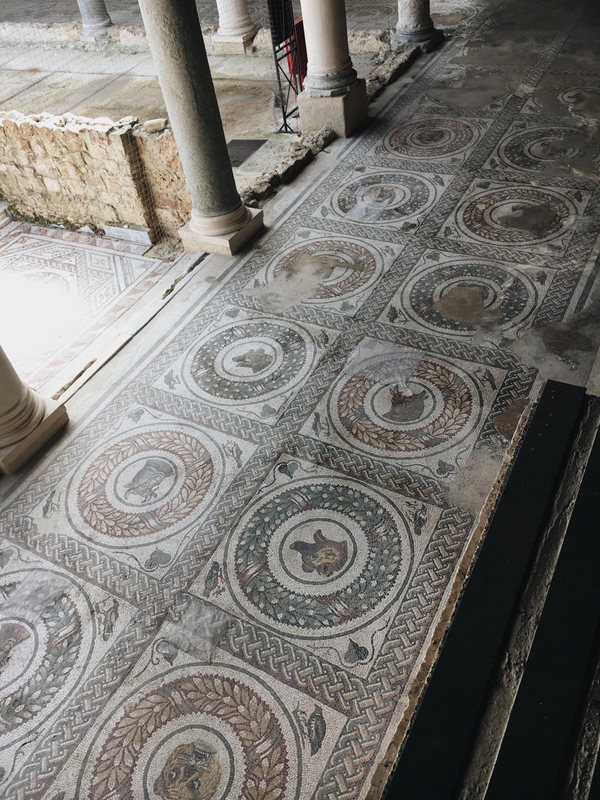 Built in the middle of the 4th Century AD as a hunting lodge/summer palace for a Roman governor, the Villa Romana del Casale is home to some of the best preserved and extensive examples of Roman mosaics. Almost the entire villa is paved with 40 separate mosaics likely produced by North African artisans, making up 3,500 square meters of mosaics. The mosaics consist of numerous subjects, ranging from geometric designs and portrayals of daily life to dramatic mythological scenes. Almost completely covered by a landslide in the 12th Century, the Villa was only rediscovered much later and was excavated in the 20th century. With over 50 rooms in total, the Piazza Armerina provides a glimpse into the sophisticated lifestyle of ancient Romans. It was likely owned by a large family of affluent Roman aristocrats whose wealth surpassed that of the ordinary rural upper classes. The mosaic in the photo is located in the arcade and features a series of animal heads framed by laurel crowns. It is presumed that these animals would’ve been brought to the estate for the Roman governor to hunt. 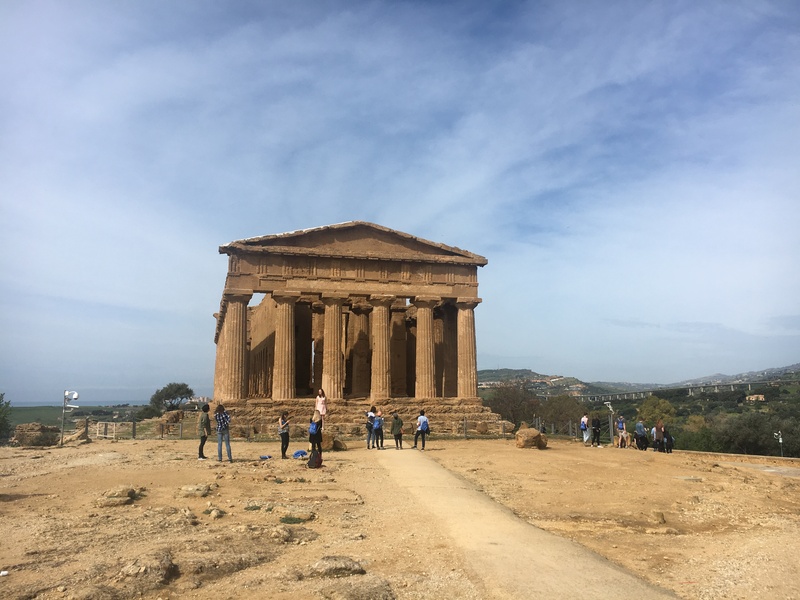 On our fifth day, we travelled to Agrigento, a city on the southern coast of Sicily. Here we visited more temple ruins; in particular, the Temple of Concord (Roman goddess of harmony) which was built at the height of Doric architecture in 5th century BC and is thought to be an “aesthetically perfect” achievement. In fact, the architecture creates a sort of illusion–the columns are slightly swelled in the middle so that from far away the temple will not appear to collapse in on itself. Looking closely. the space between the six columns is not equal, also adding to this effect. When I first saw this temple, I was surprised at how well-preserved it was compared to the other temples we had seen. It turns out that it was one of the few temples that was maintained and utilized by Christians later on. This temple in particular was turned into a basilica. From Erice, we travelled on to Selinunte, a coastal town of Sicily originally colonized by the Greeks. Here, we visited the ruins of many Greek temples. The Doric temple in this picture is termed “temple E”, also known as the Temple of Hera. We learned that this temple had likely been finished based on its fluted columns, triglyphs, and metope. 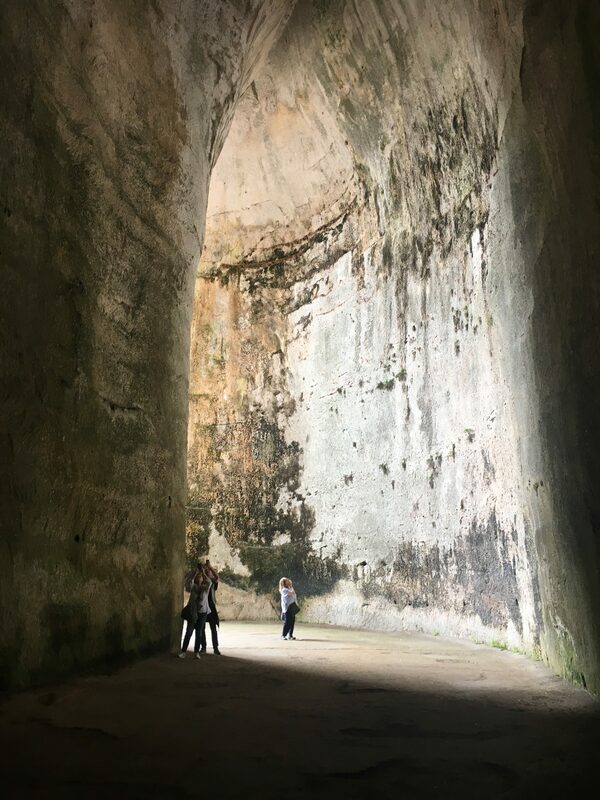 Even parts of the cella, or the inner chamber of the temple, remain to this day. A characteristic peripteral hexastyle temple, the relatively stable ruins of this majestic temple sit on a high plain overlooking the sea next to the less intact ruins of two other temples. 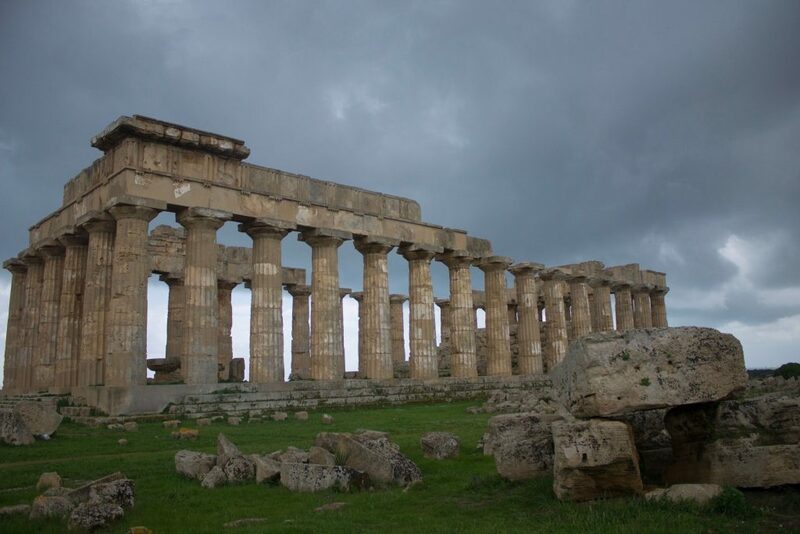 These two temples were destroyed around 400 BC when Selinunte was attacked and defeated by the Carthaginians.